Why is Saks Fifth Avenue owner buying a struggling German retailer? Why is Saks owner buying a struggling German retailer? Saks Fifth Avenue stores could soon appear in Germany. Saks Fifth Avenue is coming to Europe. Hudson's Bay Company (HBAYF), the owner of Saks, is buying struggling German department store chain Galeria Kaufhof. It is paying 2.8 billion euros ($3.2 billion) for the loss-making business, a move that will give it access to European markets. The deal includes some debt. Galeria Kaufhof, currently owned by Metro AG (MTAGF), is one of Germany's oldest retail brands. But the real prize on offer may be the prime retail real estate it occupies in many German and Belgian cities. Kaufhof has 103 stores in Germany, including 59 in prime city-center locations. HBC hinted it could open Saks stores in some Kaufhof locations, bringing the staple of American luxury shopping to Europe. Apart from Saks, the Canadian company also operates the high-end Lord & Taylor chain, and a chain of Hudson's Bay department stores across Canada. Kaufhof, while not nearly as opulent as Saks, has been at the heart of German shopping for 136 years. But it has been struggling to respond to the growing threat posed by online retailers. Sales have been declining for the past few years. In the most recent quarter, Galeria Kaufhof reported a loss of 13 million euros. The German retail market is notoriously difficult, with price-savvy consumers increasingly opting to shop online or at discount stores. Kaufhof's biggest domestic competitor, Karstadt, went bust in 2009. HBC said the transaction was part of its strategy to grow through mergers and acquisitions, and that the two companies were a good fit geographically. 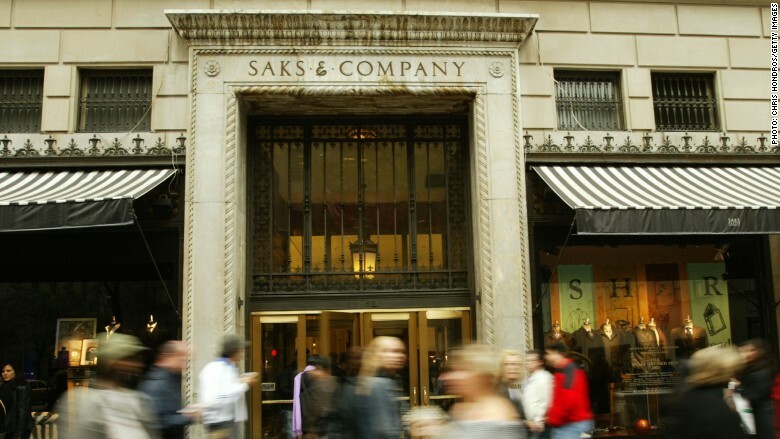 The Canadian company bought Saks in 2013 for nearly $3 billion.